What gave you the idea for the Alternate Voices anthology? JULIET: Last year I contributed a DI Lyle story to an anthology Shadows & Light to highlight the issues of Domestic Violence. 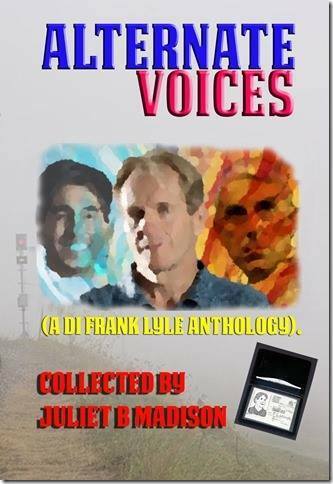 I thought it would be interesting to see if other people could write DI Lyle stories as well and the six contributors have done an awesome job and done me and the DI Lyle Mystery Series proud. I chose Macmillan Cancer Support because my late partner, David, had a lovely Macmillan nurse and I know that Macmillan do an awesome job in the UK helping people who have been diagnosed with cancer, as well as their friends and families. I have chosen to release Alternate Voices on the seventh anniversary of David’s death as it’s a bad day for me and I need something positive to focus on. Alternate Voices is dedicated to David’s memory. Can you tell us a bit about your contribution to the anthology? JULIET: My story Sudden Impact is set between Prescription for Murder and Old Sins Cast Long Shadows. James Lyle takes his boyfriend, Thomas, to visit his step-brother, Jez, in prison. The visit goes well but unexpected events on the way home force Thomas to confront his past. Some minutes later the prisoners filed in and took their seats across from their visitors. “Alright kid?” he said to James. Did you have to do much research for Sudden Impact? JULIET: I had to study the London Underground map once I found out which was the correct stop for HMP Wormwood Scrubs where Jez is incarcerated and, owing to what happens on the return journey, I had to look into the role of the British Transport Police. Just for fun, what’s your favorite DI Lyle book and why? JULIET: (Laughs) That’s not a fair question to ask the author. Although I’m not a Christian I think Unholy Alliance is my favourite because it deals with far more than the brutal murder of a clergyman; it’s about loyalty, destructive secrets and psychological torment. It’s quite dark in places and I tried not to overdo the religious symbolism. It also introduces the character of cop turned cleric Canon Thomas Rice, whom readers seem to have taken to and the Canon does actually appear in one of the stories in Alternate Voices but I’m not saying which one or who the author is. What writing-related projects do you currently have on the go? JULIET: Well I’m working on the 6th DI Lyle novel In Harm’s Way and I’m also making a start on my new paranormal crime Psychic CID series. Also Best Served Cold is currently being translated into Spanish so I’m really excited about that..
Where can readers go to get a copy of Alternate Voices? JULIET: The book is scheduled for release September 23rd. You can pre-order on iTunes, Kobo, and Nook. The book will also be available on Kindle and in paperback. Really getting excited as the launch date for this brilliant anthology draws nearer. What a great idea it is, Juliet! Thanks for the fascinating interview, Tricia – very interesting that the author's favourite book is the same as mine! Thanks Gerry. I'm excited too but for me the day will be tinged with unhappy memories. This is the toughest week of the year for me. Thanks Caroline. Look forward to reading your interview on here too. I'm excited but also sad because of what the date means. I really hope this will do well as you've also put such a tremendous effort in writing about characters that aren't your own creation. We've all done DI Lyle proud though I think.